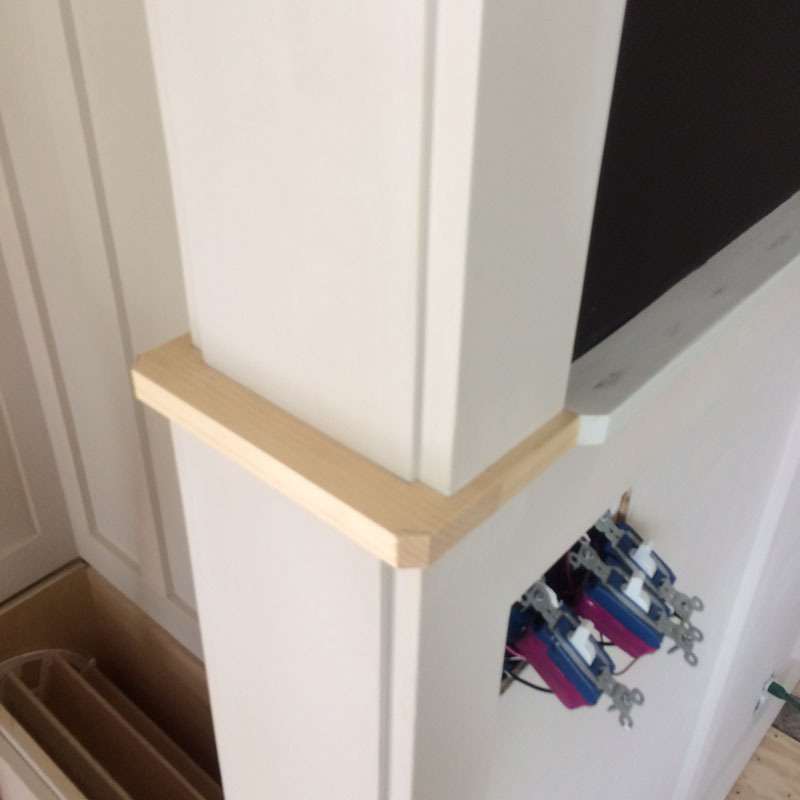 Well, I’m still fiddling in the kitchen – this is the last post in here until the floor is installed. So let’s get this post out of the way. 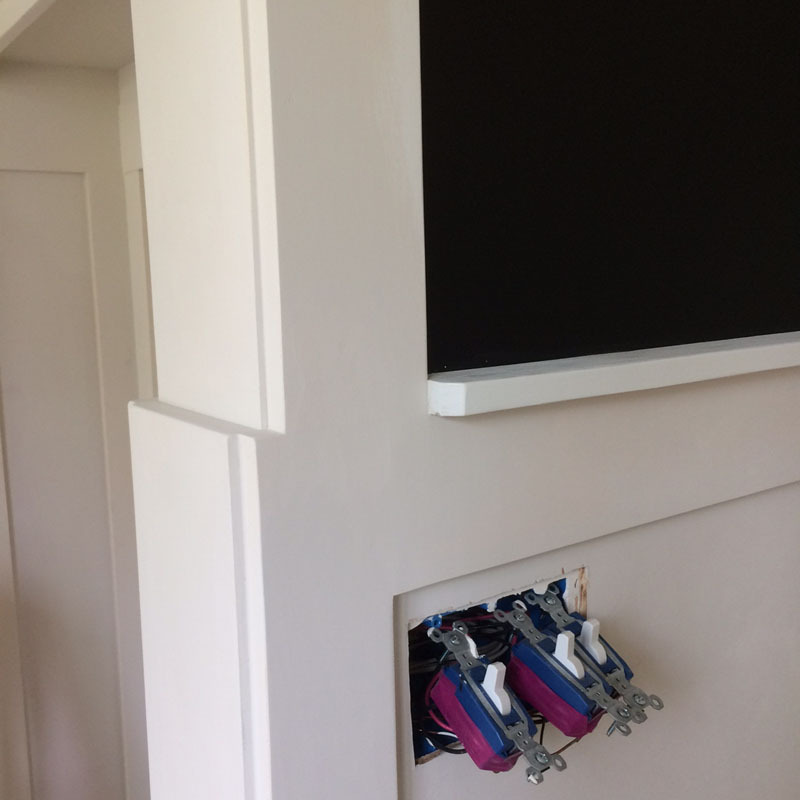 We’ll move to the mudroom next and finish those cabinets that were built several years ago. First up is finding an old picture light and painting it black. Being in the art business, I have lots of picture lights laying around. But most are just too pretty for this space. I’m using an old trade in and painted it black. I’ll add a ledge and light switch somewhere on the frame. But right now we have to finish the trim and paint in this space. Above the shoe bench and to the right of the storage space I added a deep shelf. I plan to use this to hold a big piece of Italian majolica. Like this example I have in my gallery. This one in particular if no one takes it home first. 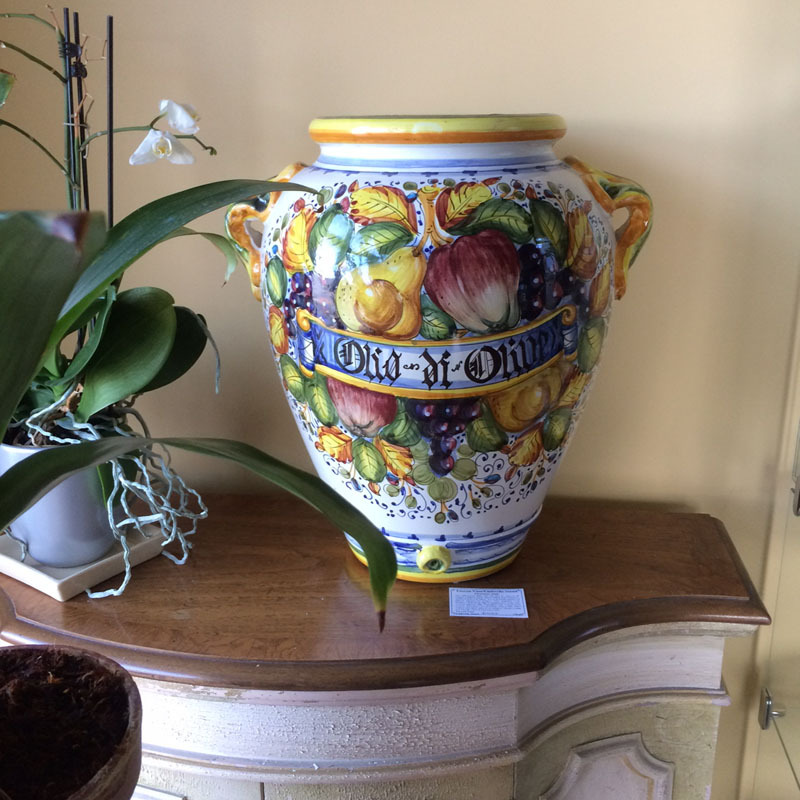 It’s 24″ tall and just fits the space…how did that happen? Now to take care of some things that were bugging me about the design. I made this pilaster / wall cap stepped back above the wainscotting. I wanted a little more room visually, so I thought this would work. Looks dumb. 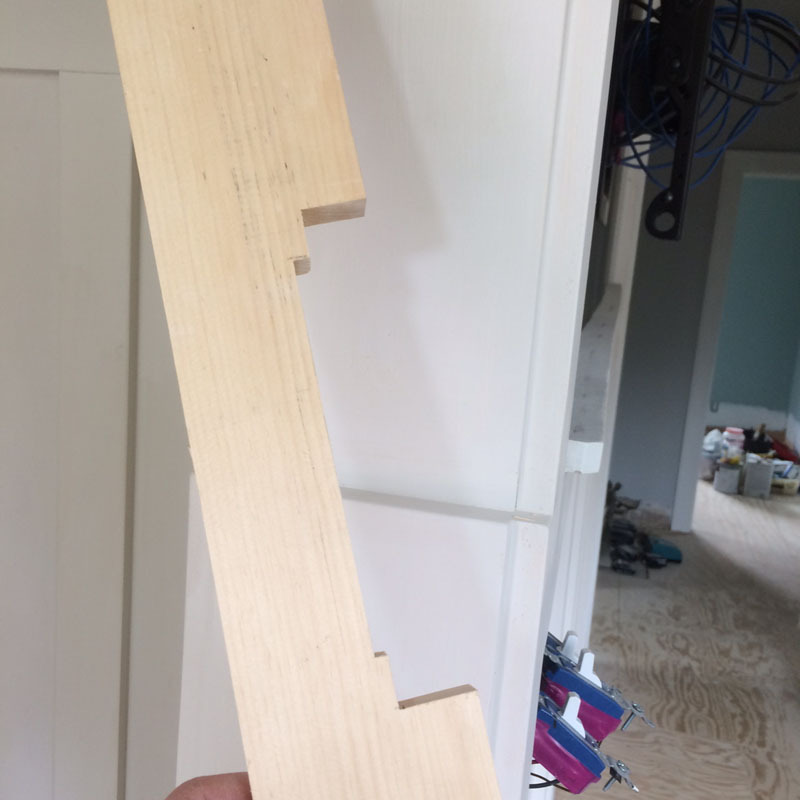 So grab a scrap piece of wood and carefully cut out the profile. And fine tune it to fit the column. I feel better now. I painted the whole kitchen with SW Egret White. 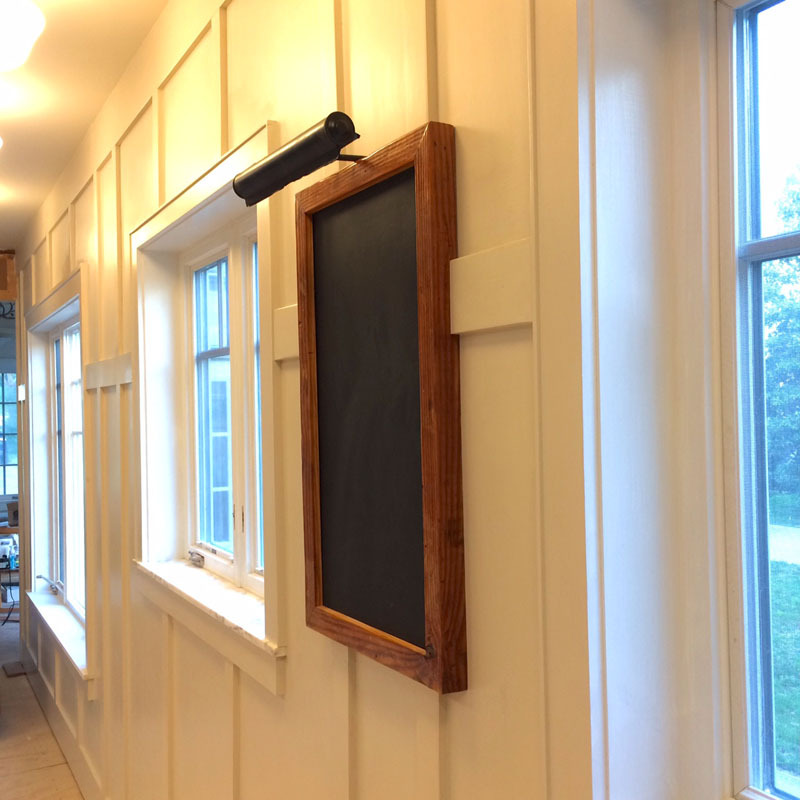 It’s the same wall color as the sunroom walls are painted. 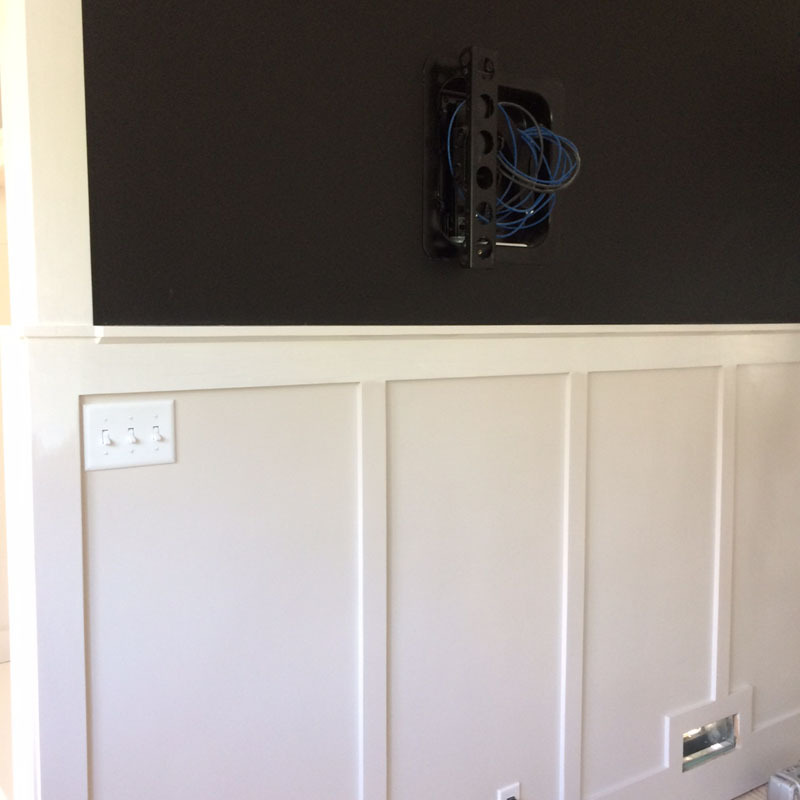 I painted two coats on all the wall trim, panels and battens. Sanded that and then coated everything with two coats of Varathane satin finish. 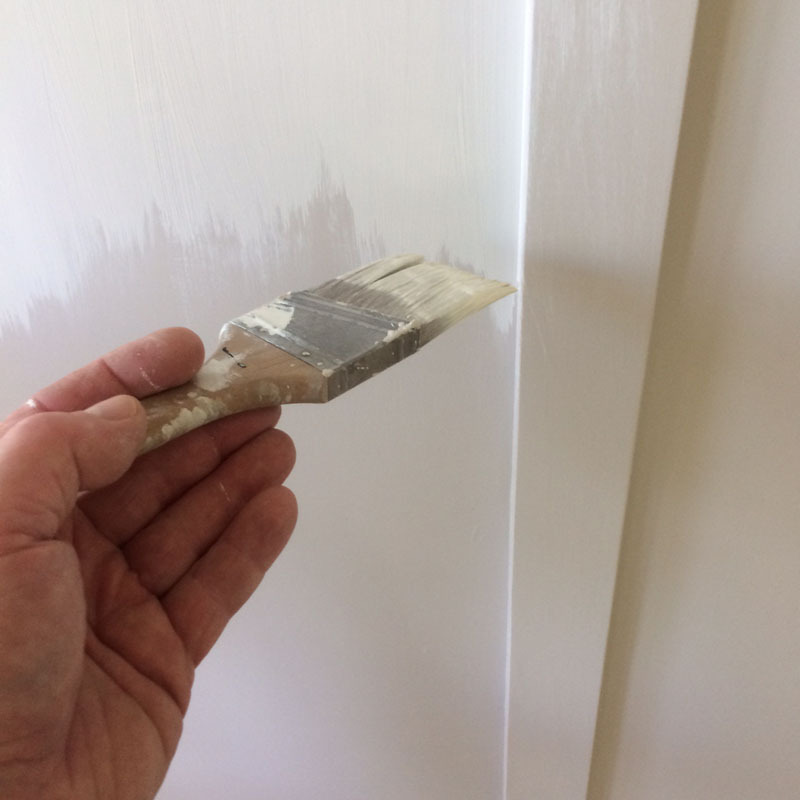 I use a small brush, as it gives it a more authentic finish than using a roller – It took a long time. But now, I’m not feeling it. The paint has a tinge of pink I think. So I had to make a test patch to see if I could live with the slightly pink color – pastels are in right now, right? So here you see me with my 2 1/2″ brush doing to whole thing over – twice.This is a BM custom white in a pearl finish. 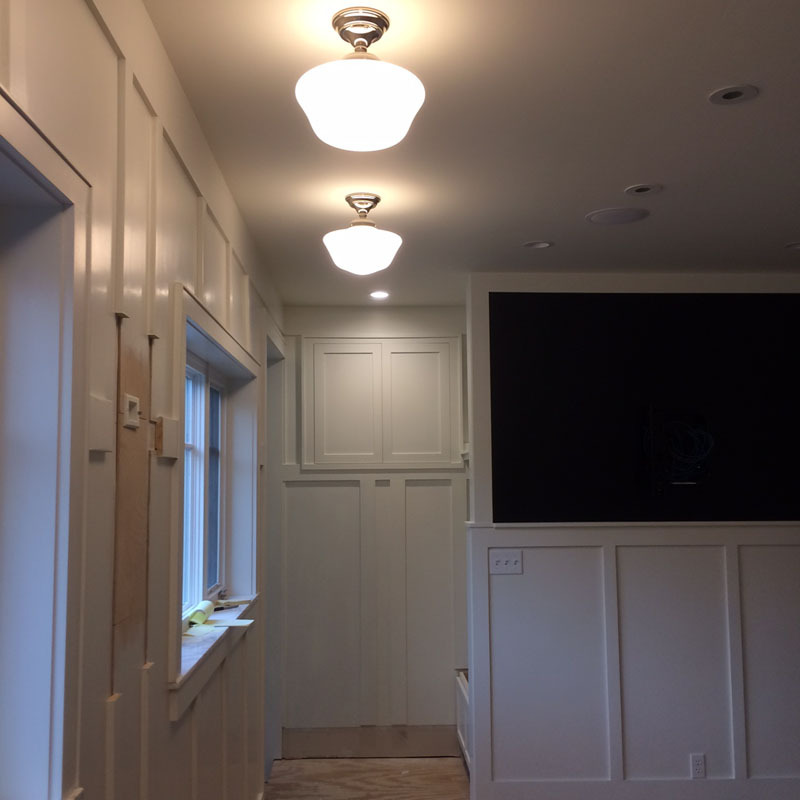 The custom color is actually a match of Valspar ceiling white – which I painted the first floor bathroom and mudroom. Why I didn’t do it here – I’m not sure, but it was a color mistake that cost me about 20 hours. I feel better and I’m ready to move on. 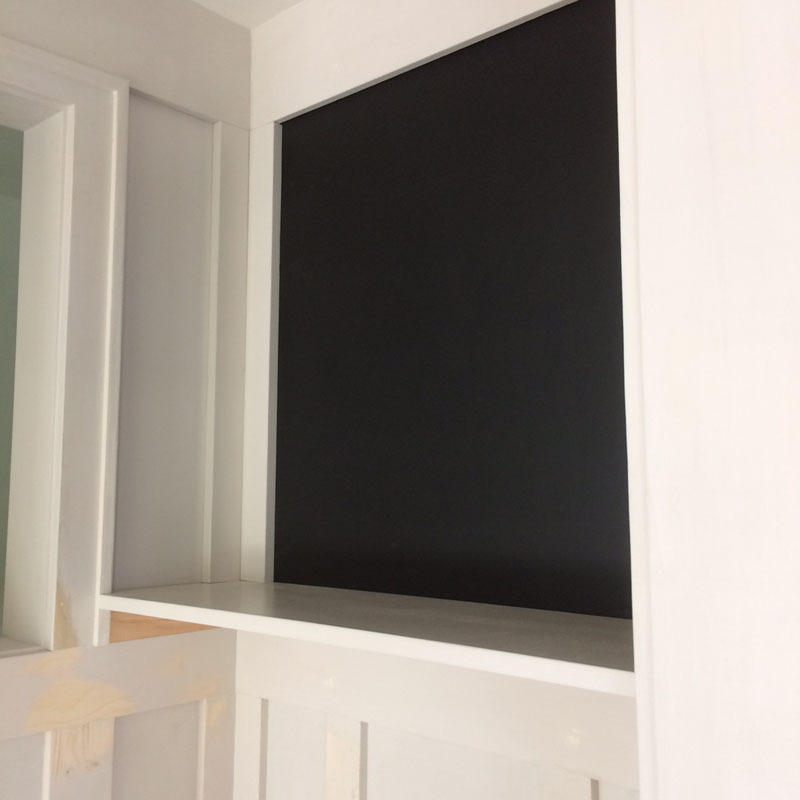 Mudroom’s next – so stick around..